Romsey is a rural township with a quickly growing residential component within commuting distance of metropolitan Melbourne. It is 55 km north-west of Melbourne, reached by the Tullamarine Freeway and the Melbourne-Lancefield Road. The name is thought to have been inspired by Romsey in Hampshire, England. At the northern end of Romsey there is the Five Mile Creek (a tributary of Deep Creek), and a hotel that was built there was a stopping place. 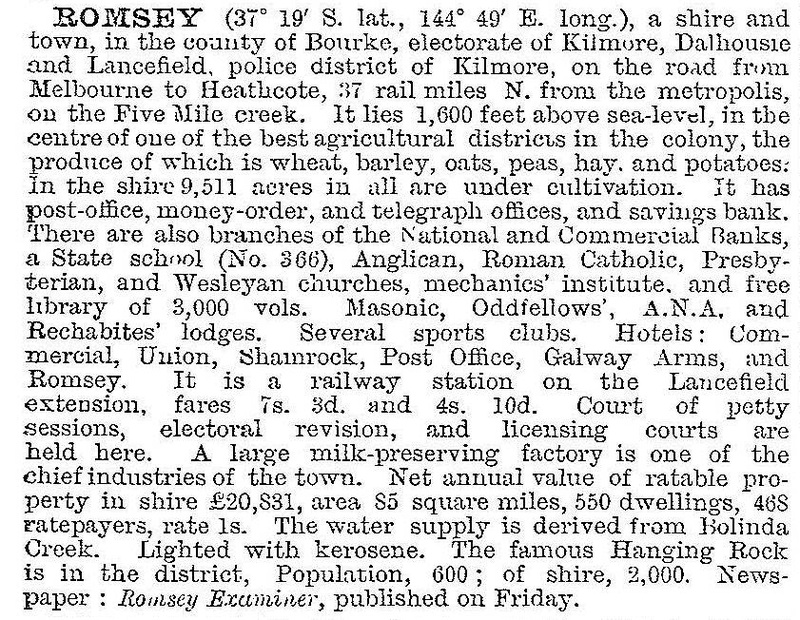 A post office was opened in the hotel in 1858, and named Romsey two years later. A school was opened at about the same time, and the present school site was occupied in 1865. Presbyterian and Anglican churches were opened in 1865 and 1871, and the mechanics’ institute in 1875. Romsey shire was created in 1871. The railway line through Romsey was from Clarkefield to Lancefield and it ran from 1881 to 1956. About 7 km north of Romsey is Lancefield. Whilst Romsey was the administrative centre of the shire, Lancefield had the district hospital and Catholic primary school (although a branch of the school functioned in Romsey intermittently). Until the mid-1970s the populations of both towns were about the same. The construction of the Tullamarine Freeway for the Melbourne Airport (1970) put Romsey within quicker reach of metropolitan Melbourne. Rural/residential and residential subdivisions occurred and continued throughout the 1980s. The township kept several of its older civic buildings, and new facilities such as an indoor sports centre were added. There are also an office of the Macedon Ranges Shire in the former post office, a library in the former shire office, a golf course, recreation reserve, tennis courts and a bowling green. Plans for an aquatic centre were rejected in 2013. The Uniting Church, formerly Presbyterian (1865), is on the Register of the National Estate, and there are Anglican and Catholic churches. Romsey has a substantial shopping centre and range of services including preschool and primary school (365 pupils, 2014). The old Romsey primary school was purchased by the Council in 2013 for redevelopment as a disabilities park. A study by the State Education Department concluded in 2013 that although Romsey was the third largest town in the Macedon Range's Shire, it would not need a high school until at least 2026.